Retail Price $6090 Your Price Just $3495! Making an investment in your freedom and independence should be one of the easiest decisions you ever make and with our Lifetime Warranty, it will be. You'll never spend another day stuck at home with a cumbersome tank or another dime on service or preventative maintenance. Portable Oxygen Concentrators draw in ambient air and use medical grade sieve to filter out nitrogen and other gasses to deliver medial grade oxygen to the patient. Fresh, and well maintained sieve beds are essential to ensure that you stay properly saturated. The Inogen One G3 and G4 are two of the only machines on the market today that are made to allow patients to change their own sieve beds. It's an extremely easy process and with this program you will receive three sets of sieve beds included in the price. Get Your New Found Freedom Tomorrow! Why wait? Overnight shipping included! 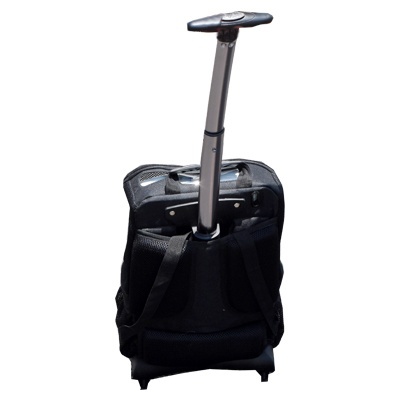 LPT Medical is one of the exclusive dealers for the rolling backpack created by Portablez for the Inogen One G3! Sling it over your shoulder to navigate through crowded areas or extend the telescoping handle to effortlessly roll it along with you as you shop or run errands. No more sore shoulders or back and it will stand steadily next to you so you can have both hands free. The exceedingly portable Inogen One G4 has a backpack as well. Carry your concentrator and any accessories you might need on your shoulders for comfortable, easy transport through your busy day. Portable Oxygen Concentrators are extremely easy to care for but like any machine, they do require some regular servicing and preventative maintenance. With this program, we'll keep your machine running in tip top shape. We believe that quality of a company shouldn't be weighed by what they do to get your business, but by how they continue the relationship down the road when you have questions or your machine needs servicing. We are one of very few distributors who are also certified service centers. This cuts down the time of repairs a great deal. If we can't figure out your machine's issue over the phone we'll arrange to have the machine sent back. Our factory trained technicians will either fix your machine, returning it to like new condition, or we will replace it. If a code comes up on your screen that you are not familiar with or your machine starts behaving strangely, we are just a phone call away. Our technicians can usually walk you through what to do on the phone. If they can't, they'll help you arrange to have your concentrator sent in for servicing, supply you with tracking information, and expedite the service process to get your machine back to you as soon as possible.